When decorating a room for young ones in your home it can be hard to live up to their wild expectations. 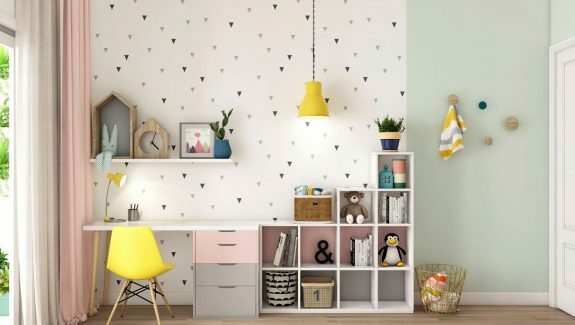 That's why we've put together this collection of 40 awesome ideas for a kid's decor scheme to inspire you. These might also help you to find some middle ground between the weird and wonderful ideas the youngsters may have, and the stylish finished item that you’d actually want as part of your home! 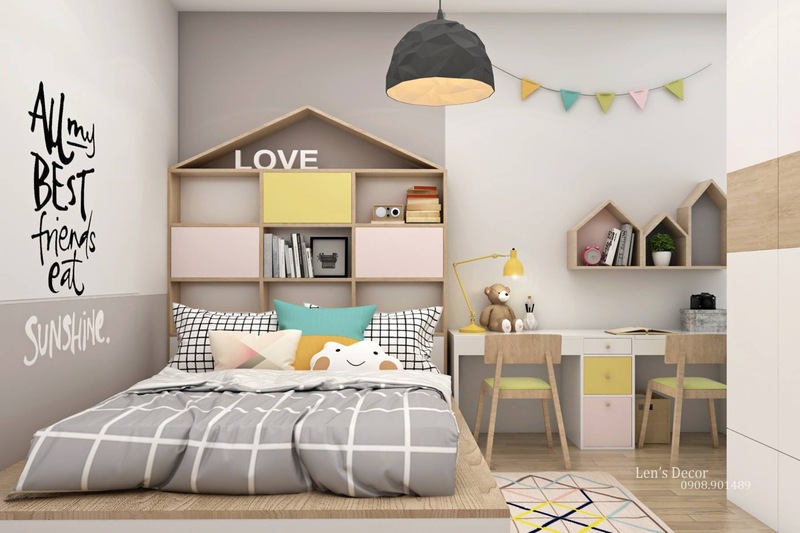 This selection of inspirational kids bedrooms use beautiful pastel color palettes in fun combinations, along with sweet decor accents and accessories, unusual beds and bunk beds, kids desks and desk chairs, plus colourful kids storage solutions. A cloud theme forms the basis of this pink bedroom. A fluffy cloud outline is the subject of the wall mural, created in two shades of pink. Two decorative rain clouds create interest on a bare pink wall above a colour coordinated storage bench. A cutaway moon and stars light up the ceiling, whilst glass globe pendant lights illuminate the bedside in this pink and wood tone room. An inspirational quote makes a bold statement across the headboard wall. Even a small bedroom can hold quirky decor ideas. 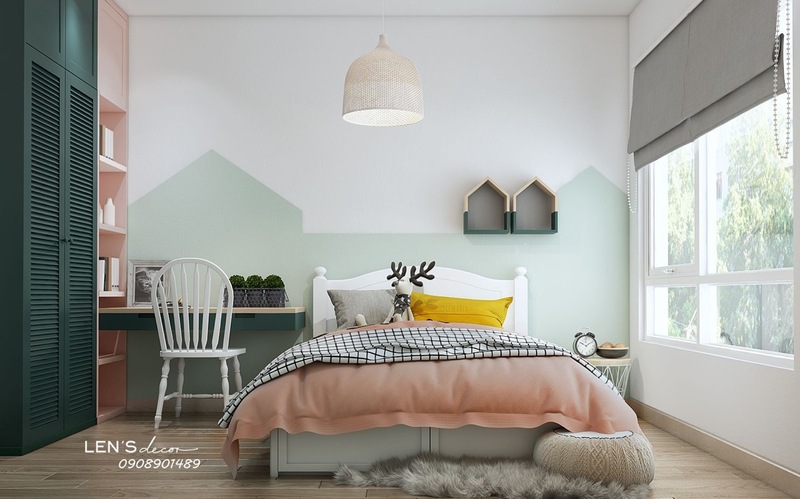 This triangular paint feature creates a cosy corner, almost like a canopy over the bed. The feature is helped along by the corner placement of a pink pendant light. Sweet shades of pink gain a modern edge when accompanied by monochrome accents and prints. 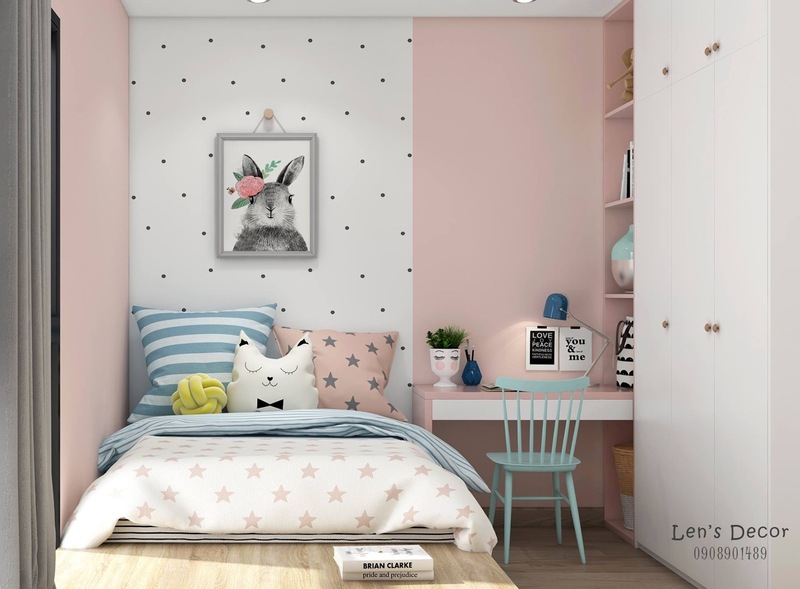 Here, candy pink bedroom furniture is set against a black and white polka-dot wall, accessorised with a monochrome typographical print and a black wirework bedroom pendant light. A wall mounted kids’ night light is plugged in by this bed. Monochrome and pastel coloured bunting decorate the upper portion of the headboard wall, whilst a tree mural adorns the adjacent space. 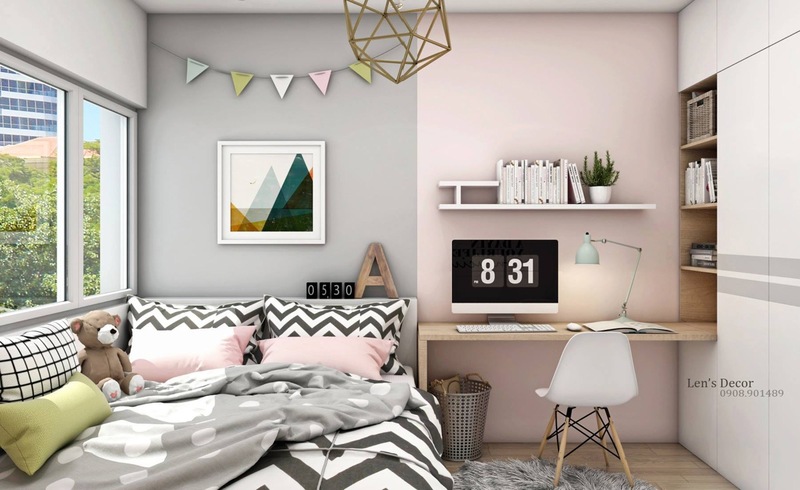 Pastel blue accessories make gorgeous contrast in a pink bedroom scheme, like this blue desk chair and large stripy cushion. Bright yellow brings unexpected zing to a muted pink palette. Zesty yellow accents can also be balanced out with areas of grey or taupe. This kids’ room has an animal themed decor scheme, with fox wall murals, a bunny ceiling mobile and a polar bear shaped seat. 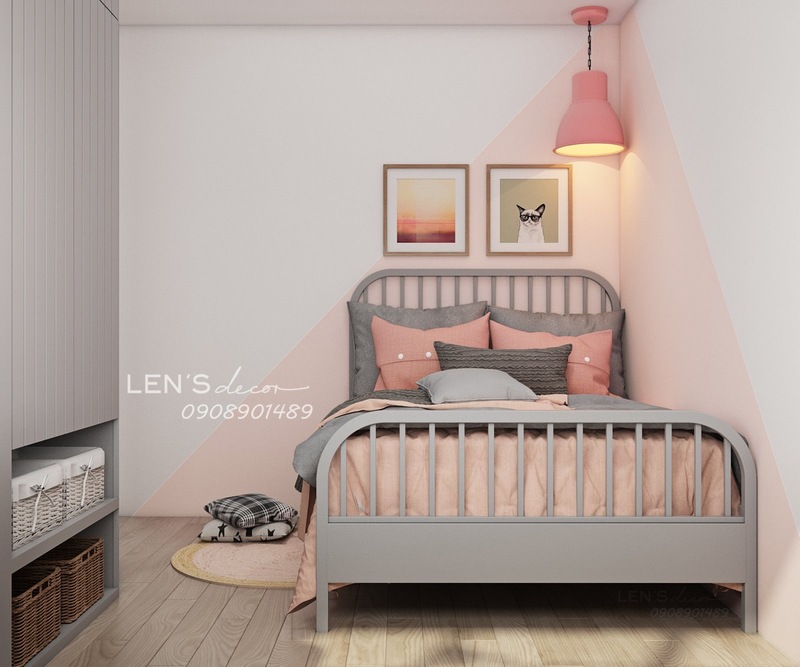 Taupe raindrops on a blush pink wall sets the scene over this kids’ bed with trundle. Geometric wall stickers make an easy alternative to wallpaper. It makes great sense to incorporate a kids’ desk into a child’s bedroom. They can be used for arts and crafts, then for homework as they grow. A casual black and white photo gallery looks stylish on a soft pink wall. 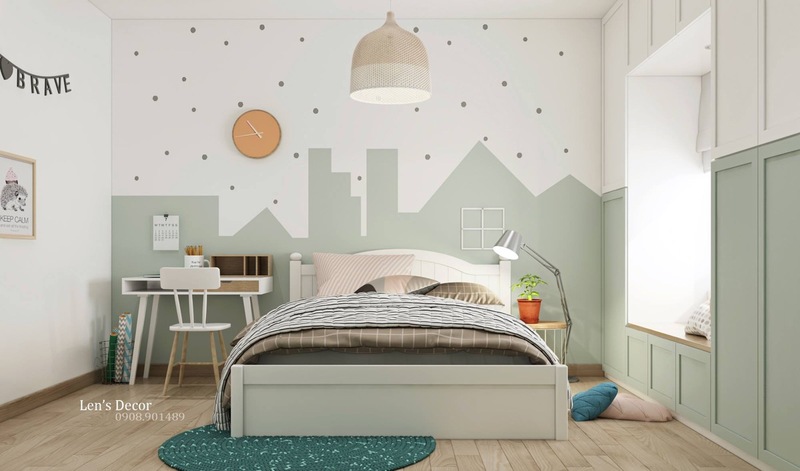 The house silhouette is all the rage for a kid’s decor scheme right now: house bed frames, house shaped shelves and house silhouette wall murals. House shaped bed frames come as double sized 4 poster beds too. Traditional four poster beds still look super pretty though, like this one decorated with dreamy sheer curtains beneath a fluffy feather pendant shade. 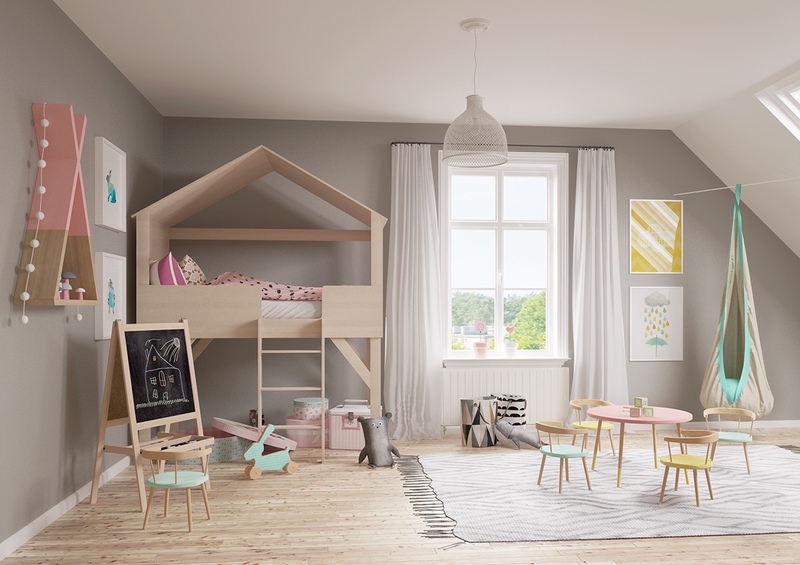 It’s a nice idea to have a few kid’s chairs in a bedroom – even if the space is not shared. Extra seats can be used to encourage siblings in to play, provide seating for play dates, or even just to seat the dolls and teddy bears invited to tea. 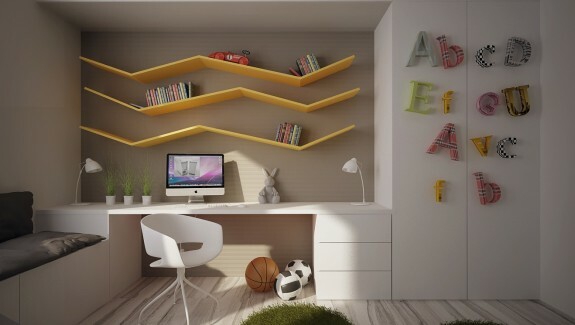 These unique wall shelves incorporate the house shaped theme above a childrens’ desk. 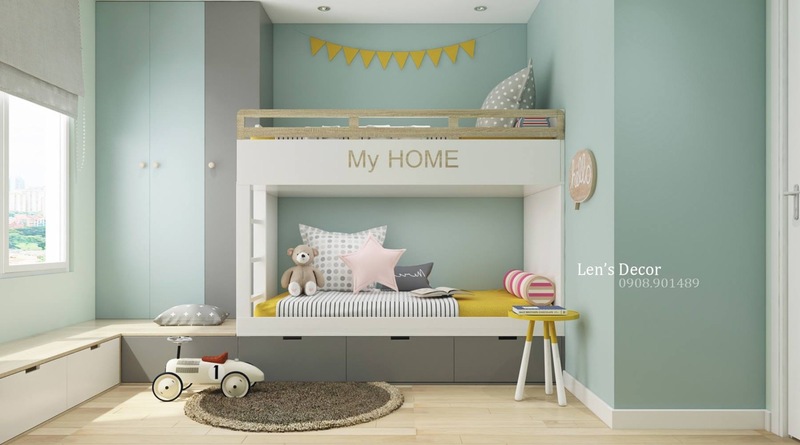 A clever bunk bed design can make a large item of furniture appear part of playtime, as well as offer opportunities for extra storage. 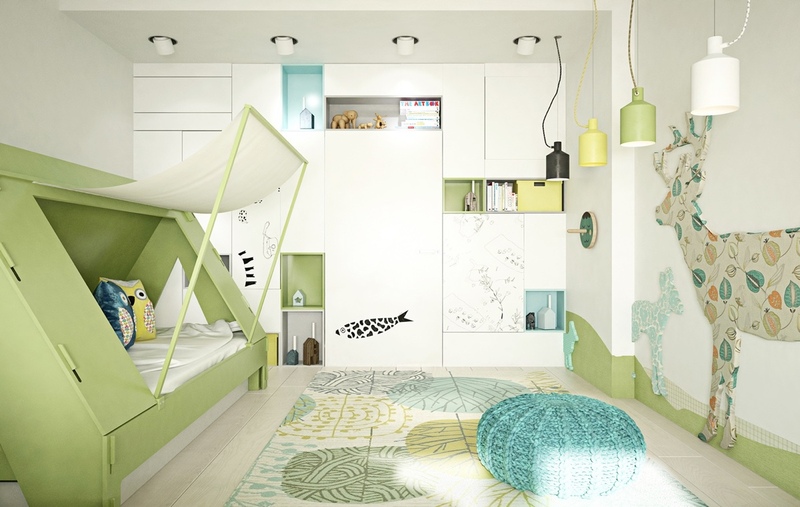 Don’t be afraid to incorporate both children’s favourite colour into one bunk bed. Green and coral make a striking colour combination in a bedroom. 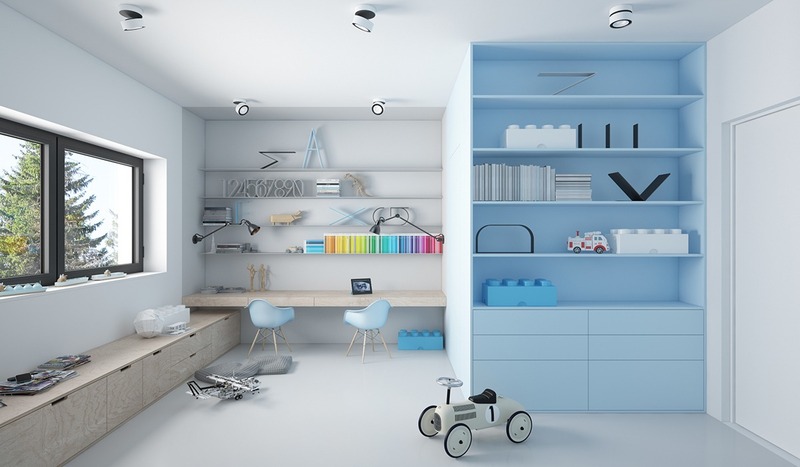 Wall hooks are another practical addition in a kids’ room design. They can be used to quickly hang up clothes off the floor, or organise school bookbags and kits. 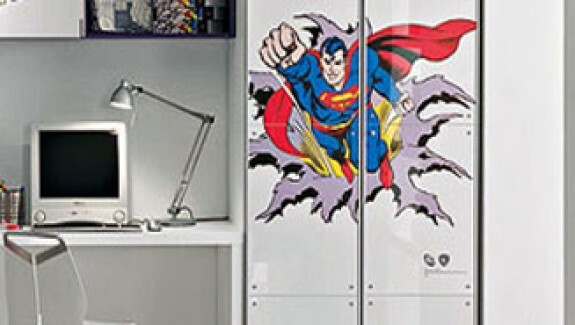 Shared kids’ rooms can be tough to organise. Make sure you give them each a place to sit at a desk to avoid squabbling. 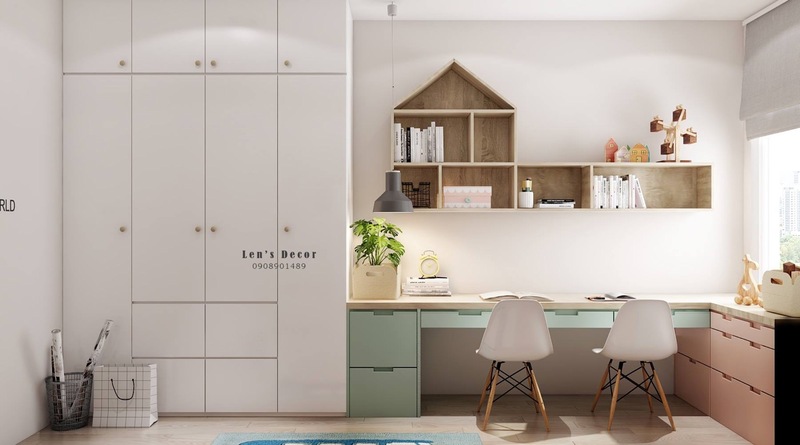 A house shaped memo board, wall shelf and even a pitched doorway add interest to this bedroom. This older kids’ room incorporates a strong geometric print over the duvet cover, complemented by a wireframe geometric pendant light. Older children may prefer to have their work areas more spread out to avoid overcrowding one another. This window seat provides a fluid continuation of line between the two separate work places. If your space won’t suit a large four poster bed frame, this pitched roof headboard is a nice alternative to incorporate the fashionable house shape theme in a more subtle and space saving way. A ceiling mounted swing seat is always happily received by young ones. A blackboard wall is another popular addition. 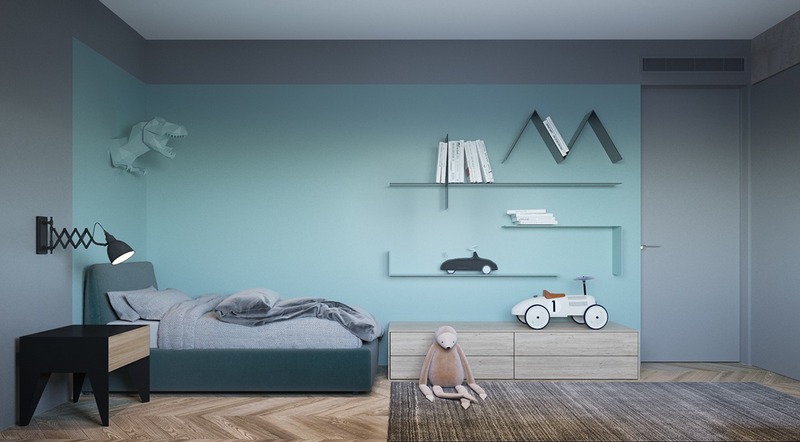 This luxury kids’ room has bespoke units to make the most of the challenging shaped space. A desk has been incorporated into the cabinetry. LED strip lighting and a designer table lamp illuminate the work area. This platform bed has integrated shelves at its foot. A yellow desk chair, sunny recessed shelves, bunting and a couple of scatter cushions add energy and warmth to an aqua blue bedroom. Wall clocks are a nice way to add a spot of contrasting colour to a decor scheme. Don’t forget that double workspaces need double the storage. Pink and grey storage spaces at this desk are colour coded for each child. The walls of the room are green to match botanical artwork and planters. 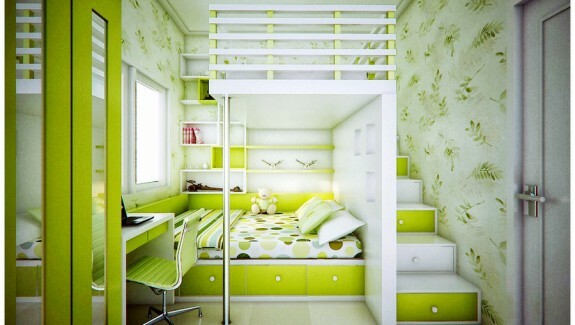 This green bedroom would be great for keen little campers. 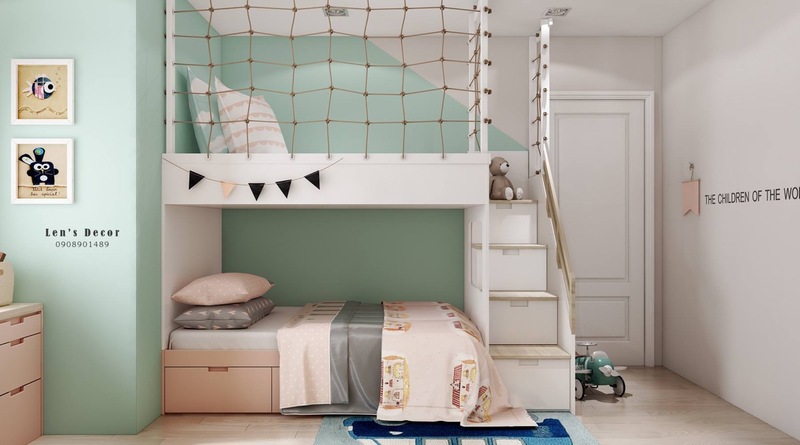 Since kids’ beds are the biggest item in the room, if you can fit them into an alcove you can save masses of valuable floor space needed for playing. Panels of solid colour create cosy zoning. 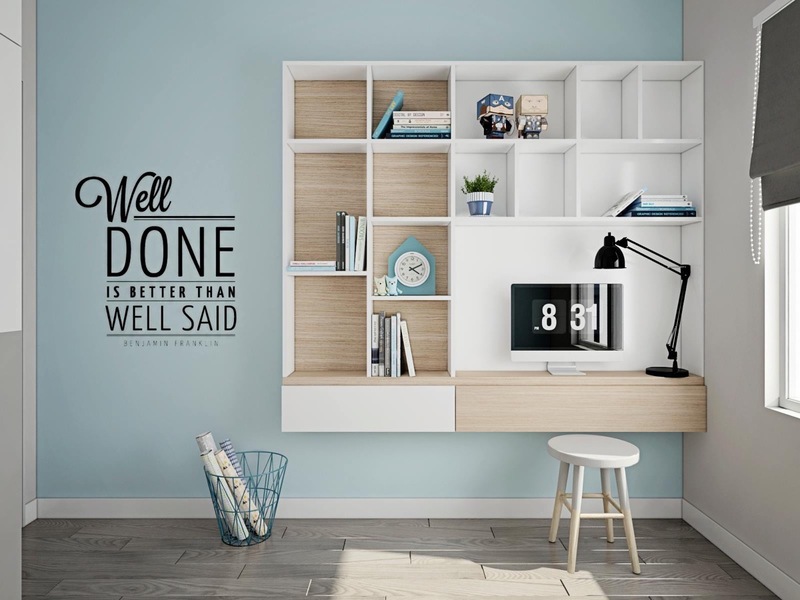 A wall mounted desk keeps the floor looking clear. Neon lights brighten a plain wall. Low level storage means even small kids can tidy away the toys – bonus! Cabin beds provide extra space for all kinds of things, from storage and desks to settees and televisions.